Coalfish are classed as the Cheetahs of the cold waters around Norway and Iceland and anglers from across the world are flocking to Norway and Iceland to target them. These saltwater Coalfish grow to a massive size and can reach weights of up to 50lb. These are regularly caught every week in Norway. Such places like Lofoten Islands and Havoysund in North Norway are the main areas, where you can possibly smash the world record for Coalfish. A great summer species. 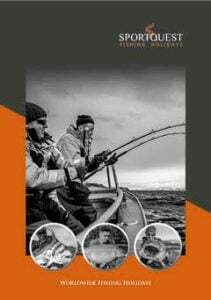 We are extremely pleased to be able to offer you yet another fantastic opportunity to fish this part of the world as a single angler or small group and would like to welcome you to Vesterålen. Located in the north of Norway surrounded by some of the most stunning landscape Norway has to offer. This destination is an excellent area for a mixed species trip. Description: Coalfish is a codfish that can be found both near the surface and on the seabed down to a depth of 300 metres. It is a shoaling fish that may gather in large numbers where there is plenty of food. Lots of travelling anglers have now started to target these supercharged fish from the surface as the takes are explosive and can last a long time with the average size being much larger off the surface. Average Size: The average size of the Coalfish ranges from 4lbto over 50lb but on average you should expect them to be around 15lb. They tend to be much bigger where you find faster water like such places as the Lofoten Islands. Where to catch: Norwegian Coalfish become sexually mature at the age of 5-6 years and spawn in winter along the Norwegian coast, from Lofoten to the North Sea. The spawning period peaks in February, after which the young drift passively northwards with the currents. Small Coalfish appear in southern and western Norway in spring, and by the coast of Finnmark as late as August. A lot of the shoals migrate to fast flowing waters to feed up in August to late September, waters such as the very powerful Moskenesströmmen located at the very end of the Lofoten Islands is the perfect area and habitat for these very active and hungry fish. Fishing Methods: Early on in the year the bigger specimens will be found in the middle layers of the water feeding on krill and other crustaceans. When the water temperature rises the Coalfish appetite increases greatly and these micro food items aren’t enough anymore so they switch over to Herring, Sprat, Blue Whiting, juvenile Haddock and Mackerel. The methods of fishing for them will differ given the season you are fishing. Later in the year, the Coalfish tend to push baitfish to the surface so fishing poppers, stick baits and slow sinking small shads work very well and always pick up the bigger specimens.